Okay, it's a slight exaggeration to claim that Sky+ owners are taking to the streets in protest of the non-appearance of Dual Recording on Sky. However the expression of frustration from Sky+ owners is fast becoming a major talking point on forums on the Web, and through e-mails to Plusworld. The latest vague statement on Sky's own PR website, states that this long awaited feature is "coming soon" - quite when "soon" is, is anybody's guess. I was in the audience last August listening to Sky managers extolling the virtues of Sky+ and informing the gathering that if they could get Dual Recording out for Christmas, they would, but they couldn't guarantee it. Of course nobody asked the obvious question which was " Which Christmas are you aiming for?"! The saga of Dual Record keeps rumbling on, as the programme clashes build up and the frustration of knowing that the Sky+ box was designed by Pace to carry out this very function, a function which so far we have been denied. Of course everyone, Pace, Sky and Sky+ customers want to ensure that the eventual software update delivers a flawless and complete solution that will leave everybody happy. But the sheer complacency of Sky in taking so long, simply because they have no real competition in the PVR market. This makes the pill of patience hard to swallow for Sky+ customers, who have been waiting almost 2 years for this feature that will transform Sky+ from a great piece of kit, into an unbeatable and mesmerising solution to program clashes. To an outsider it would seem that Sky are not placing enough resources with the Development Team to ensure that constant and consistent software updates are delivered to the Sky+ subscribers. Subscribers who, not unfairly expect their £10 per month for research and development costs to bear fruit more regularly than present. It's unfair to lay the blame at the hands of the Developers who are working hard to bring us the next phase of Sky+ development, but as usual it's the managers and communicators who are "letting the side down". True, Sky shouldn't unfairly raise the expectations of subscribers just to dash them when plans don't quite go to timescale. However a state of limbo where no-one knows for sure, outside of Sky, what the status of each software update is, shows no consideration or respect for Sky+ subscribers. Openness, Honesty and being upfront are the qualities we expect from a leading company such as Sky. Sadly, Sky+ owners get little of any of these currently. It would help Sky to realise that it's remit is not ALL about money and maximum revenue per subscriber, there is such a thing as customer satisfaction, the Sky+ product gives this in volumes, Sky the organisation does not. 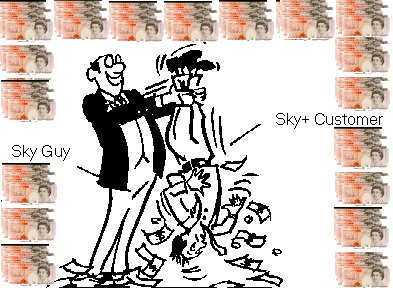 The "closed" culture of Sky is gradually opening up, but the mantra from Sky+ users is still the same: "Communicate with us - please!" Footnote: The betting currently is that Sky+ will get its Dual Record feature before September 1st 2003. This is not based on "shared information from Sky" but rather deductive detective work and following those in the know outside of Sky, that there is going to be a multi million pound advertising campaign for Sky+ starting around September time. So June, July or August it is then! And don't expect Sky to leave it until August because they need the mass user feedback on Dual Recording to ensure that they are not going to market with a "turkey"...Until then, hang onto your hats...!